Pray for us lil Alfie. Praying for little Alfie Evans and his family, along with the final end of the culture of death, by conversion of hearts, which seeks to push for nothing but death, through euthanasia and abortion. 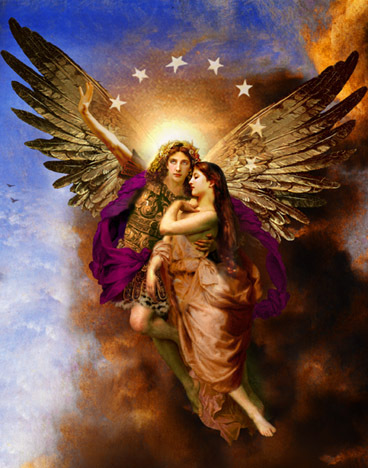 This picture is called “Escorting Souls to Heaven” by Howard David Johnson. By praying for the dying, we are in fact walking that soul as far as we can home, to our Lord..
A few months ago, I was with a good friend who was passing on from this world, to eternal life. I sat at his bedside and through our Lord, managed to break the selfish bonds I had attached to him. I started to pray. There were a few souls in the room with him at this time who were conversing about the old days when our friend was in better shape and spirits. Rather then continue in the small talk, I listened to the voice telling me to get to work. In doing so, quickly recruited them to pray with me.